As some of you know, I've been redoing my sunroom into a project room. It's a lovely room full of windows with french doors and a fireplace. I've pulled up carpet and painted the floors, pulled up tile, painted furniture, recovered a bench seat and began putting everything in place to show to you. 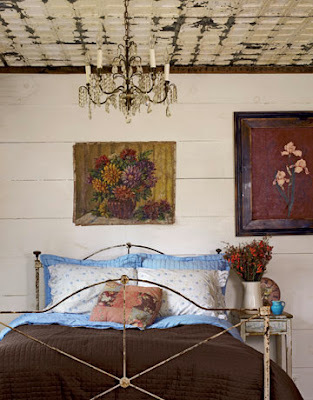 My inspirations for the room were all of the beautiful pictures in blogland of neutral rooms. You've seen them. Rooms that are decorated with just shades of cream and white and linen and burlap. Perhaps they added pale blue or soft green or a touch of pink but overall the room is very neutral. I love those rooms. They seem so calm and so pretty. So, this is the direction I took with my sunroom. As my sunroom was coming together, I stopped. The fact is, it wasn't coming together. It felt like something was missing. I didn't like it and I wasn't comfortable in it. I kept moving things around and looking for things to put here and there and waiting for it to be awesome. I haven't shown you pictures of it or had a big reveal post because I just don't like it. So, I decided to take a step back and rethink it. Problem is, I don't know what to rethink. Everything in there looks good. So, why don't I like it? ...it all made sense to me. Of all the great pictures she featured, I was drawn to this one. While I don't LOVE every single thing in it, I LOVE the overall style. This picture is me. It has neutral walls, vintage decor, antiques, chippy paint, rusted pieces, metal, and....wait for it....COLOR! I realized I am not a neutral person. I must have some color and preferably a little red color splashed about. I need some contrast, some diversity, some pop. I think it describes my personality. People who know me wouldn't describe me as a neutral person at all. I'm one of those who likes some cherry, vanilla and lime in my Sonic Sprite. So, I'm making some changes to the sunroom redo you never saw. I'm adding some color. Hopefully, now that I have a plan I'm excited about, I can get that darn room finished and start enjoying. I will post pictures when it is just the way I want it. Are you neutral? How do you like your Sonic drink? I had great advice from LeAnn when she said to make it "Rondell's" so that's what I do, glad to see you are following your heart! I'm not neutral I have to have some color in a room too! I'm with you entirely. I always think it would bother me to live in a neutral room - what if I brought a beautiful red bowl home from a vacation somewhere and then I couldn't use it because it didn't match the neutralness of the room. I like to throw pops of colour in here and there as well. I also have to say it pains me to paint a wall white. I just feel like no progress is being made. I'm dying to see the room I didn't see before. Looking forward to your pops of colour. Oh, and I've never had a Sonic drink. I'm not even really sure what it is, although I'm guessing it is pop. I'm just like you! I love how calm neutral rooms can be, but my house is cozy and warm with lots of rich reds, browns and blues. I like a regular Dr. Pepper during Sonic's 'happy hour' cuz I love to crunch the little ice pieces! Can't wait to see your finished room! I've tried all neutral but I tend to find myself putting colorful pieces in it..can't fight it!! Good for you: I have found myself in that conundrum too. You need to feel like you in your house. Go to it! Go with what you love! I'd be very unhappy in a home with absolutely no color. That picture is to die for-- the trim on the walls, that ceiling. . . wowsas. Can't wait to see your sunroom (still jealous you have a sunroom). I am not even slightly neutral. Hey Gina. So glad I could help (well kinda anyways - really, it was Country Home though I'm happy to take the credit :-). I love that bedroom too though I think it's all the chippy metal that draws me in cause I must admit I'm a neautral girl at heart. Can't wait to see your sunroom. I don't have Sonic here!! I think they may be down in the Bay Area. But not here. WHAA! And now I can't wait for the color infusion. Glad you figured out what you need to do to make it a happy place for you. I am certainly not a neutral person. Give me some color.